Children as well as adults love to hear the inspirational story about Hogan’s courageous journey. The multi-award-winning author, Connie Bombaci, will be signing her book, Hogan's Hope, at the Westport Barnes and Noble! Personalized copies make wonderful gifts, and shoppers can get a very special present for a friend or family member — or themselves. Judea, Connie's deaf pup and licensed service dog, will be greeting customers to demonstrate what loving family members deaf dogs can make and how the myths regarding deaf dogs are untrue. Profits from the sales of the book, Hogan's Hope, will be donated to non-profit animal organizations and deployed service personnel. Christmas is coming fast! Be sure to add special, author-signed copies of Hogan's Hope to your shopping list and come to Barnes and Noble in Barnes & Noble (Stamford, CT). Hartford Pet Expo - 2 days! The award-winning book, Hogan's Hope, will be returning to the 2018 Family Pet Expo in Hartford. Author Connie Bombaci states, "Profits from our sales will be donated to the Connecticut Humane Society. Hogan was rescued by the CHS where we were able to adopt this extraordinary pup who brought great hope and inspiration to lives of so many. We want his legacy to continue." Hogan's Hope is a multi-award-winner. "We are looking forward to continuing the Connecticut Pet show, with some improvements and additional shows within our show! First and foremost we have moved the show to a pet-friendly facility so now pet parents can bring their well-behaved leashed pets with them,” said Dennis Garetano of Family Pet Shows. Garetano went on to say, “We have pets attend all our other shows in Pennsylvania and New York – everything from dogs, cats, pot-bellied pigs, miniature horses, ferrets – so we are very happy to make the CT show pet-friendly now!" The show will stay in Hartford and has been moved to the XL Center in 2017, making the show pet-friendly and at a larger facility to offer more to Connecticut pet lovers. “The Pet Show has always been the premier event for Connecticut pet lovers. As our business expands we realized the Connecticut Pet Show would be best produced by Family Pet Shows, as they are the experts producing stellar pet events. We feel the Garetano’s are positioned to take the Connecticut Pet Show to the next level,” stated Wesley Jenks, Vice President of Jenks Productions. Family Pet Shows has been producing consumer pet shows for more than 20 years and currently have 3 shows in Pennsylvania (Greater Philadelphia Pet Expo in Oaks PA, Lehigh Valley Pet Expo in Allentown, PA and the Morgantown Pet Expo in PA) , 2 shows on Long Island, (Long Island Pet Expo in the Park, every September in Copiague, NY and their larger show Long Island Pet Expo, every March at Suffolk Community College in Brentwood, NY). Family Pet Shows is excited having the Connecticut Pet Show as a big event on their roster. Because of the overwhelming success at the June book signing event, the multi-award-winning author, Connie Bombaci, is returning to Sun Rose Words & More for the Fall Block Party. Asbury Avenue will be closed to vehicular traffic from 5th – 14th. Streets on Asbury Ave. Over 400 crafters, food vendors, music, and more. In the evening, fireworks over the boardwalk from 6th – 14th Streets. Hogan's Hope returns to Sun Rose! The award-winning author, Connie Bombaci, will be signing her book, Hogan's Hope. Personalized copies make wonderful gifts, and shoppers can get a very special present as well as an early start on holiday shopping. Hogan's Hope is the inspirational story of a deaf dog who escaped death during the time when the prevalent belief was that deaf dogs needed to be destroyed. It is the tale of a legendary deaf canine champion who endured severe abuse and prevailed as he turned upside down the myths of deaf dogs being dumb, difficult to train, and harmful. Hogan learned over seventy words in American Sign Language, engaged in normal puppy activities, and provided the hope of life, not death for deaf dogs worldwide. Through perseverance and enduring hope, Hogan's courage provided inspiration to anyone, human or pet, that success and genuine love are truly possible. This heroic deaf dog continues to reveal that by choosing hope, anyone's dreams can come true, and the world can be filled with steadfast faith, pure joy, and unconditional love. It's a story like none other. Profits from the sales of the book, Hogan's Hope, will be donated to non-profit animal organizations such as the OCNJ Humane Society and deployed service personnel. Hogan appeared on television shows including Dateline NBC, Oprah Winfrey, Jack Hanna’s Animal Adventures, Amazing Tails, and others. For more information call 1-800-BEACH-NJ. Connie, the award-winning author of Hogan’s Hope, and her deaf dog, Judea, will be visiting the Chester Library on September 29. Connie will be giving her inspirational presentation on hope and how we can all gain and give love and acceptance no matter what our challenge. She will show attendees how deaf dogs can learn to understand American Sign Language and perform other normal, doggie activities. Participants will watch first-hand just how wonderful deaf dogs can be and how, by choosing hope, their own dreams can come true, no matter what the challenge. 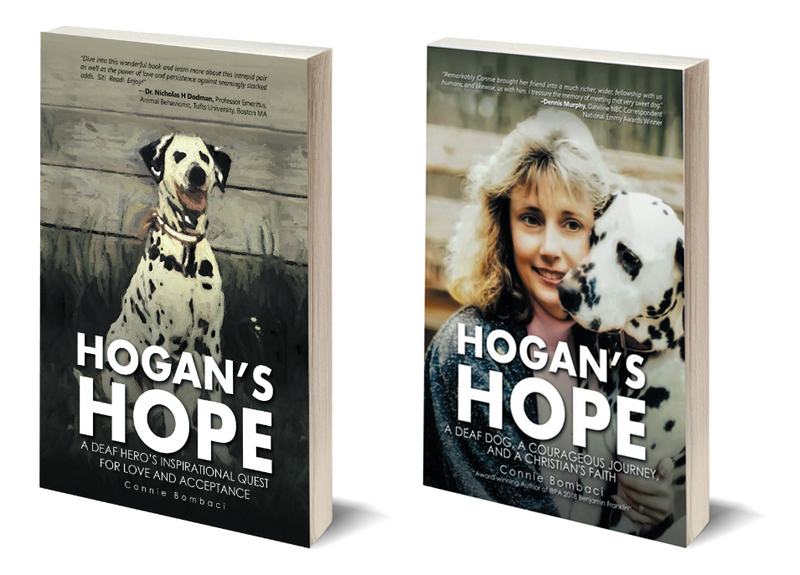 Award-winning author, Connie Bombaci, will be personalizing copies of the book, Hogan's Hope, during the 2018 Chester Dog Fair on September 15 and 16 from 10:00-3:00 each day. Profits from the sale will be donated to Homeward Bound CT whose mission is to "find homes for the thousands of dogs languishing and dying in kill shelters across the country. Please consider opening your heart and home to a shelter dog the next time you add a canine member to your family." Profits from the sales of the book, Hogan's Hope, will be donated to Homeward Bound and their extraordinary efforts to save our precious animals. Open up a whole new world for your pet when you attend [the] PET & MARKETPLACE weekend. This is your pet’s chance to shine in daily contests! Connie Bombaci will be at the CT Renaissance Faire with her award-winning book, Hogan's Hope. Judea, her deaf pup, will be greeting folks to show guests what wonderful family members deaf dogs can be. Connie Bombaci will be signing her award-winning book, Hogan's Hope, at the Sun Rose Bookstore in her family's favorite vacation spot, Ocean City, New Jersey. This book signing is extra special and is hosted by the 2017 Best in Community Service. Customers enjoy a wide array of items from words to music. Connie's family has been vacationing in this beautiful town since the 1920's and continues annually with large gatherings of parents, children, grandchildren, aunts, uncles, cousins, and more. Be sure to mark your calendars now! Connie loves meeting new readers and thanks this beautiful, welcoming establishment. Join authors Connie Bombaci and Shawn Flynn at the lovely Bank Square Book Store in downtown Mystic, CT. Connie, along with her deaf dog, Judea, will be greeting readers about her book, "Hogan's Hope: A Deaf Hero’s Inspirational Quest for Love and Acceptance." Shawn will be sharing his story of "THE KITTY Who Rescued Me After I Rescued Him," Customers will be able to get personalized, author signed copies of these award-winning books. Join Connecticut authors in raising funds for the Colchester Dog Park! Connie Bombaci and Shawn Flynn will be signing copies of their books, Hogan's Hope and THE KITTY, respectfully, for this fun and worthwhile cause. Connie Bombaci will present the women an overview of what inspired her to write #Hogan's #Hope and how the #Lord guided her writing in telling the story of her #deafdog and his quest for #love and #acceptance. Each year Super Pet Expo brings thousands of pet lovers together for three days in a shopping and entertainment extravaganza. Join authors Connie Bombaci and Shawn Flynn at the Super Pet Expo in Edison, New Jersey for a fun-filled weekend of nothing but pets! Shawn and Connie will be signing copies of their books, Hogan's Hope and THE KITTY. Deaf dog, Judea, will be making her appearance and welcoming guests at the author table. Connie Bombaci will be in appearance for the Chester Public Library to offer visitors a presentation on deaf dogs and information on her award-winning book, Hogan's Hope: A Deaf Hero's Inspirational Quest for Love and Acceptance. As a special treat for everyone in attendance, her sweet, deaf dog, Judea, will accompany Connie to demonstrate just how smart deaf dogs are and what great family members they can be with the love and acceptance they deserve. Authors, Connie Bombaci and Shawn Flynn, continue their book signing tour in Delaware at the Barnes and Noble in the Christiana Mall. Connie will be personalizing her book, Hogan's Hope: A Deaf Hero's Inspirational Quest for Love and Acceptance and Shawn will be signing his book, THE KITTY Who Rescued Me After I Rescued Him. Both books have received several recognitions and awards. Deaf dog, Judea, will meet and greet customers and demonstrate the wonderful bond and love that a deaf pup has to offer. Join authors Connie Bombaci and Shawn Flynn at Barnes & Noble in Wilmington, Delaware on Saturday, February 10th. Connie will be talking about her book, "Hogan's Hope: A Deaf Hero’s Inspirational Quest for Love and Acceptance" while Shawn will be sharing his story of "THE KITTY Who Rescued Me After I Rescued Him" Hope to see you there! Judea, deaf since birth, has learned American Sign Language and offers hope of love and acceptance for everyone, no matter what the challenge. Join authors Connie Bombaci and Shawn Flynn at the Greater Philadelphia Pet Expo on Friday, Saturday and Sunday, January 12th - 14th, at the Greater Philadelphia Expo Center, 100 Station Ave, Oaks, PA, for a fun-filled weekend of nothing but pets! Shawn and Connie will be signing copies of their books, Hogan's Hope and THE KITTY. The public is welcome to bring their well-behaved, leashed pets. Join Award-Winning authors, Connie Bombaci, and Shawn Flynn as they continue their popular book signing tour and visit the Barnes & Noble in Exton, PA. Holiday shoppers looking for last-minute presents will be able to obtain very special gifts for their family and friends by purchasing personalized copies of the books, Hogan's Hope and THE KITTY. Books make the perfect gift for everyone! Deaf dogs are often destroyed, mistreated, or abandoned. Hogan’s Hope is the tale of a legendary deaf canine hero who, after being rescued from neglect, prevailed as he learned over 65 signs in American Sign Language and thereby providing the hope of life for many deaf dogs worldwide. His courage to overcome challenges and prejudice continues to give inspiration to anyone, human or pet, that accomplishment, success, and genuine love are truly possible. Through his lifetime of determination, his story offers us the promise that we are capable of achieving an amazingly “ordinary” life and a life away from isolation. From hardship to success, hope gave the inspiration for overcoming any challenge. His journey of valor reveals dreams come true and offers insight into the world of true faith, unconditional love, and endless hope. Indeed, it is a story that needs to be told. Read and gain immeasurable hope! A touching and inspiring story of heartfelt companionship, The Kitty offers an uplifting perspective on what it means to find true friendship in this world. Anyone who has ever shared a meaningful connection with a pet will fall head over heels in love with Kitty and Shawn. As Shawn discovers, sometimes we don't even realize we need to be rescued--until we are. Young Olivia travels to the Virgin Islands to settle affairs after receiving word her mother, a highly acclaimed photographer on St. Thomas, has perished in a boating accident, but island police have no record of her death or even the accident. Could her mother still be alive? Olivia desperately needs the truth, if she has to find it herself. A bar brawl. A break-in and robbery. Her mother’s Caribbean bungalow ransacked. Can things get any worse at picturesque Magens Bay? Olivia’s search takes a sinister turn when a charming man, claiming to be her mother’s lover, is shot and she’s the prime suspect. Set in an old family run inn on the rocky, tumultuous coast of Maine, Murder on the Precipice is a captivating mystery page-turner. Elizabeth, a successful Manhattan interior designer, grew up in the inn and is thrilled to leave behind her tyrannical boss and the big city for a few days after her grandmother asks her to return to her childhood home. Upon her arrival, Elizabeth learns a young female guest is missing in a case that is eerily similar to an unsolved disappearance on the property years earlier so she makes it her mission to find the girl and save the inn. But in her search for answers, Elizabeth uncovers shocking details that challenge everything she thought she knew about her herself, her family and her past. Connie Bombaci and deaf pup, Judea, will be appearing with other fellow Connecticut authors at the Holiday Craft Fair in the South Windsor High School. Her book, Hogan's Hope, will be on sale and available for a personalized autograph just in time for the holiday, gift-giving season. Doors open at 9:00 AM! Deaf dog, Judea, will be visiting the Clinton PetCo in order to educate customers about what wonderful family members deaf dogs can be. Dog and Cat Lovers Unite!!! Connie Bombaci and Shawn Flynn continue their Barnes & Noble tour in Stamford, Connecticut on Saturday, October 28 at 1:00 PM. Connie will talk about her book, Hogan's Hope, the tale of a deaf canine who, after being rescued from neglect, prevailed as he learned American Sign Language. Shawn will talk about his book, THE KITTY, a heart-warming story that reveals how the pets we love sometimes turn around and care for us. Judea, Connie's deaf pup, will be in attendance to demonstrate just how deaf dogs can become wonderful family members. Connie Bombaci, author of Hogan's Hope: A Deaf Hero's Inspirational Quest for Love and Acceptance, will be at the Westfield Pumpkin Festival to sign copies of her book. Judea, her deaf pup, who loves to welcome customers and show everyone how wonderful deaf dogs can be as amazing family members, will be unable to attend as formerly planned. Judea is recovering from surgery. Westfield's Town Green will serve as the hub of activities with a wide variety of fun things for folks of all ages to be entertained. "Attracting and engaging children and families will be central to this event." Pet-loving, Connecticut authors, Connie Bombaci and Shawn Flynn, continue to team together for an author appearance and book signing of their books, "Hogan's Hope: A Deaf Hero's Inspirational Quest for Love and Acceptance" and "THE KITTY Who Rescued Me After I Rescued Him." Dog and cat lovers come to enjoy being entertained by this author duo who bring genuine warmth about our four-legged family members to their readers. Connie Bombaci will be visiting the Connecticut Building at the Big E in West Springfield, Massachusetts on September 30 from 1:30 - 5:00 PM to sign her book, Hogan's Hope: A Deaf Hero's Inspirational Quest for Love and Acceptance. Hogan's life is revealed as he journeys from severe abuse to triumphant success. Additionally, Connie's deaf dog, Judea, will be in attendance to show customers just how wonderful a deaf pup can be. Pet-loving, Connecticut authors, Connie Bombaci and Shawn Flynn, team together for an author appearance and book signing of their books, Hogan's Hope and The Kitty. Dog and cat lovers, alike, will enjoy being entertained by this author duo who bring a special warmth and reaching out to their readers. Deaf pup, Judea, will also greet folks and demonstrate what wonderful family members deaf dogs can be. Dogs and cats come together for an evening with pet-loving CT authors, Connie Bombaci and Shawn Flynn, signing purchased copies of their books, Hogan's Hope and The Kitty. Deaf pup, Judea, will be in attendance as well to demonstrate just how wonderful deaf dogs can.